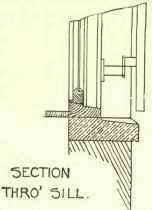 The custom of fitting shutters to all windows is not so common now as formerly, especially in the case of the "Boxing," or more correctly "Folding," Shutters (see Fig. 144). These are constructed in two parts, each part covering half of the window, and consisting of two or more leaves, according to the space to be covered. The leaves are hung "folding," - that is, turning back on each other, - the whole being hung to the window frame, and when not in use turning back into a recess. The outer leaf, or "shutter," is framed and filled in with moulded panels, and forms a splayed or square jamb lining to the windows, according to the design. The inner leaves are usually termed "Flaps." If not wide they may be formed of solid boards, mitreclamped to prevent casting; but if required of a greater width than from 8 to 9 inches, they should be framed. Where they are liable to be much used the side next to the room should have the panels moulded. Another form is that known as "Lifting Shutters." These are hung with cords and counter-balancing weights similar to those of sashes in cased frames. They are framed and panelled, and if the windows are wide are fitted with rails, the panels being moulded. The frame is fixed inside the window frame, a space being left between the two for the blind. A space must also be provided below the window board to contain the shutters, the window board being hinged so as to cover the shutters when not in use. A cover flap is usually hinged to the jamb, so as to close over and hide the hanging cords. The top of each shutter is fitted with a flush ring for the purpose of raising. The shutter next to the window, when closed, covers the top sash, and the other the lower sash, and the meeting rails when closed should overlap sufficiently to allow of their being fastened together with a thumb screw. External Louvres, made in the form of sliding shutters, or, as they are sometimes called, Venetian Shutters, are used principally as sun blinds. They consist of two frames, each the full height of the window and half the width, carried in a guide frame extending the width of a shutter on each side of the window, so that the shutters may be pushed back quite clear of the light space. The shutters should be made of a frame of 1-inch stuff, 3 inches wide, dovetailed at the angles, and filled in with 1/2-inch louvre boards, spaced so that the lower edge of one overlaps the upper edge of that beneath it, and housed 3/8 of an inch into the sides. The bottom of each shutter should be fitted with a pair of brass pivot rollers, and 1/4-inch play should be allowed in the guide frame, which should be made of teak or some other hard wood. Another form of external shutter is the French "jalousie," consisting of a wood frame with wood louvres. This is hinged at the side and attached to the window frame by specially constructed wrought-iron hinges. In England, where reveals are generally used, a large projecting hinge becomes necessary, so that the shutter can lie flat against the wall at the side (see Fig. 145, which is extracted from the side when open, and, being usually painted green, give a pleasing effect to otherwise uninteresting exteriors. For this reason they have been introduced into English houses. Being simple things to make, they can easily be fixed on a house already erected, provided enough of the frame is exposed for attaching the hinges to, as any local joiner could make the shutters, and the hinges, although peculiar, can be made by any smith.